project known as “Green Patrols”. „Green Patrols” have been established on the basis of public initiative through the cooperation of Project Footprints and Riga's Technical University. Their task is to carry out a study of green zones (parks, forests, lakes and rivers) and other territories. In carrying out a survey of the public to clarify the real situation regarding environmental pollution and the problems arising from it. to notify the public and responsible institutions and office-holders regarding the results of our work. Green Patrols do not enforce penalties upon discovering an offence on the spot. Their duty is to notify the police about the offence or the potential likelihood thereof. The involvement of those taking part in the Green Patrols in nature conservation, public information and informal education will promote a reduction in the pollution of nature, public education and joint responsibility and involvement in the resolution of environment problems. „Right now, the necessity for public involvement in nature conservation has become a hot topic to such an extent that the active participation of the population is required to reduce the pollution of nature. We have to discover our responsibility within ourselves along with the motivation to transform ourselves from passive observers into active defenders of our rights – because every one of us has the to seek out the right to: breathe fresh air and enjoy pristine nature within ourselves. Nature will never really be a private item and property belonging to some specific individual. I would very much desire that each individual with whom I am forced to share one era and space would understand the reciprocal connection to my activity and that of everybody else in this realm will prove to be a benefit or loss to all of us. Therefore, I invite everybody to think about the priorities in our lives and to occasionally donate our time, energy and resources to ensure that nature is our source of inspiration and health for as long as possible. Many thanks to Riga's Technical University and personal thanks to Professor Dagnija Blumberga and I wish the „Green Patrols” every success. Environment Minister Raimonds Vējonis, Olympic Committee President Aldons Vrubļevskis, Olympians' Club President Inese Jaunzeme, Olympian Arturs Irbe, Professor Dagnija Blumberga, director and journalist Vija Beinerte , Baiba Sipeniece and others. Meeting up on October 15 at 14:00 at the RTU Faculty at Kronvalda bulvāris 1. 20 more trees in Riga. 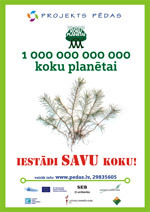 In 2007, the Project Footprints got involved in a global campaign organized by the UNEP „One Billion Trees for the Planet” and this year with the support of Latvian State Forests, we have already planted around 2,800 trees in schools, local government territories and cities. 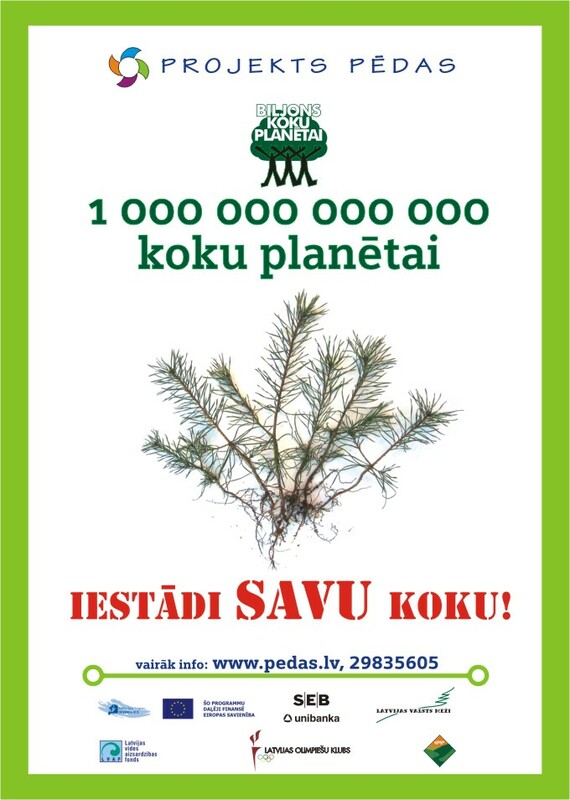 This Friday, in response to concerned letters from residents regarding trees being sawn as a result of the construction of the new Jugla highway, Footprints is organizing a tree-planting work session together with the Executive Directorate of Riga City Council's Vidzeme Administrative District. Taking part will be employees from the Executive Directorate and activists from the Footprints work group. We plan to plant around 20 trees at the terminus of the route 6 tram. Meeting up on October 5 at 15:00 at the terminus of the route 6 tram in Jugla. Also taking part in the clean-up operation will be RCC Environmental Department Director, Askods Kļaviņš and Olympian, Aigars Fadejevs . This autumn in Valmiera, „Project Footprints” organized the Green Walk on September 22. We cleaned up the territory from the Vanšu Bridge to the Kazu Rapids. This is a popular leisure and walking territory, because it is located close to the centre. However, at the same time it is natural and fresh as a result of close proximity to pine forests. More that 40 participants from various age groups took part in the clean-up operation. 7 m3 of waste was collected, 5 containers were prepared and installed and 4 trees were planted. Jānis Daliņš, son of the famous sportsman of the same name was an active participant in the clean-up operation, as well as a representative from the Municipality of Valmiera - Kristīne Tropa. The clean-up operation was fun for all involved, full of active and creative work and blessed by sunny weather. The organizers of this clean-up operation: "Delve 2" and "Austris" stores, SIA "Triāls", "Valmieras mēbeles" and the "Northern Vidzeme Waste Management Organization” and the Vidzeme Olympic Centre. On Saturday, September 15, Cēsis hosted a CAMPAIGN – CLEAN-UP OPERATION jointly organized by Project Footprints and Cēsis City Council. During the clean-up operation, we cleaned up several important places popular with the general public. We were joined on the walk by: Juris Žagars, Gundega Skudriņa, Andžela Brice, Zane Rozīte, Kristīne Garklāva and other residents of Cēsis. 187 people took part in the clean-up operation. Thank you to everybody who took part! Special thanks to Cēsis City Council! Project „Footprints”, Cēsis City Council, SIA Fēnikss ZG, SIA Cīruļkalns, guest house „Rakši”, SIA Stingers, SIA ZAAO, SIA Ragn Sells, SIA Jumis, i/k Debesīs, Latvia’s Green Belt, Cēsis Sports School, Vidzeme History and Tourism Centre and the Cēsis Culture Centre. Information backers: Radio 3, periodical: Druva. Around 100 people took part in the clean-up operation and 24 m3 of rubbish was collected. Around 80 people took part in the clean-up operation and 32 m3 of rubbish was collected. 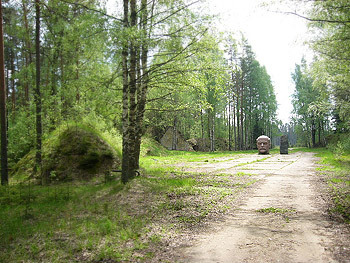 The Suburb of Latgale’s garden district by the Daugava was cleaned up. Many thanks to everybody who took part and did not take fright!! In partnership with Project Footprints, The British Embassy in Riga has found the 6 best schools in Latvia that done the most to reduce their impact on the climate. The winners were found through a competition named ''The Green Triangle Battle'' during which pupils reduced their school’s ecological footprint by carrying out simple measures. 7 tons of waste paper was collected during the competition and a self-prepared flyer provided information to the local community on how to save resources – both environmental and financial, cloth bags were sewn and distributed, newspapers were published, a significant quantity of electricity was saved, the sorting of waste was commenced and project weeks were organized on the environment and its protection etc. 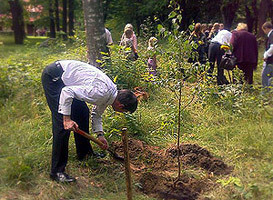 The British Ambassador in Latvia, Ian Bond joined the decorated heroes from the „One Billion Trees for the Planet” campaign in planting a birch grove at the Ethnographic Open-Air Museum. This is a 1040 km long route that Krišjānis Barons carried out on foot at a time when he was studying at the University of Tartu in Estonia. On May 12, Project Footprints concluded its spring season of activities with Family beautification events across Latvia. In partnership with Virbi Parish Council. In partnership with Talsis Primary School. 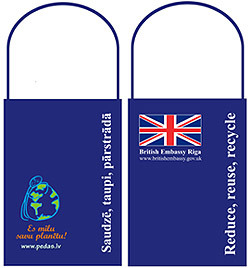 In partnership with Riga City Council , Latvia's Green Point and the Zemgale Regional Executive Directorate. In partnership with Valmiera City Council. May 5. Beautification Event in JELGAVA! 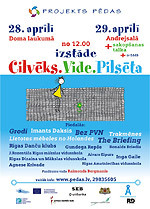 On May 12 this year within the parameters of Family Day, Project Footprints in partnership with the Ministry of Children's and Family Affairs and the portal: Draugiem.lv invited all of Latvia's municipalities and residents to engage in the beautfication of Latvia, inviting residents together with their families to beautify their cities and places of birth. Koknese Parish " Family support day centre "
Bēne Parish, Dobele District . Malta young family society "Hestija"
During the beautification events, territories were cleaned up, trees were planted – each city received 3 trees as part of the „One Billion Trees for the Planet„ campaign and a creative competition was organised. On April 28, 29 in Riga, the Doma Square hosted an exhibition „People. The Environment. The City”, which is unusual due to the fact that the exhibition was created from degraded, that is, finite materials. The exhibition concept was based on the main accent of this year's Footprints Project - saving resources. Responding to the global campaign announced by the UNEP „One Billion Trees for the Planet” Footprints presented trees to schools and municipalities. Tree planting campaign PLANT FOR THE PLANET in Jyväskylä, Finland. Human. Environment. City. on the Dome Square. The idea of the exhibition is to attract public attention to the city environment, human and entailed industrial interrelations, environmental problems, relations between human and nature in urban context, also to instigate people to care for nature resources and to conserve environment, which significant part is the very human being. Visitors on the day of opening of the exhibition on the Dome Square will have an opportunity to participate in creative workshops, managed by writers, artists and musicians – Gundega Repše, Aivars Eipurs, Ronalds Briedis, Inga Gaile, Agnese Krivade, Patrīcija Brekte, Uģis Vītiņš. In parallel with the exhibition, creative workshops and presentation of trees there will take place also a concert with participation of Imants Daksis, Riga Dancing Clu, a folklore group Grodi, bands The Briefing, Bez PVN, Lietotas mēbeles no Holandes, Trakmēness. 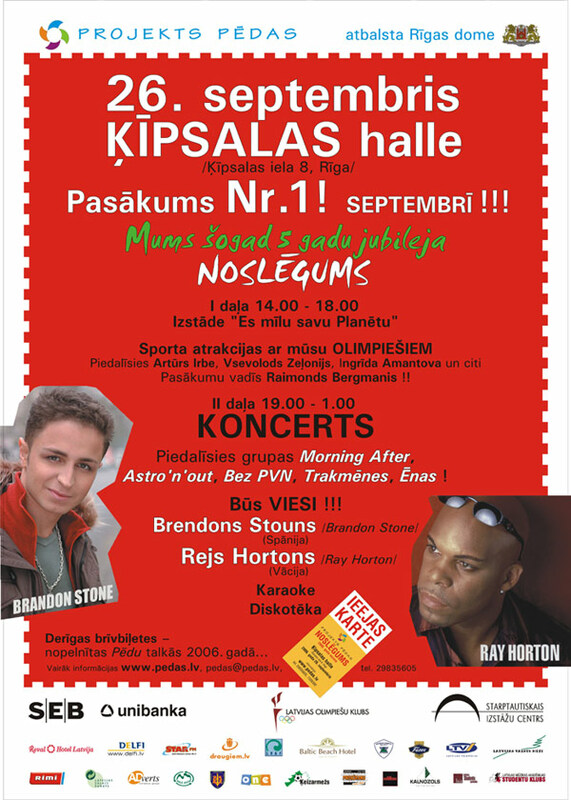 The event will be conducted by Raimonds Bergmanis. The exhibition has been organized with partial funding of the INTERREG III A Program. Backing: SEB Unibanka, Latvian Environmental Protection Fund, Riga City Council, RC Cultural Department, Andrejsala, Latvian State Forest, Ķeizarmezs. Information support: 5min, DELFI, StarFM. An environment that is cleaned up personalises the environment each of us lives in. In this year spring-like winter a larger part of the society has to set greater attention to environment and climate – related matters. Taking into consideration topicality and necessity to comprehend interrelationship of environment, the Environmental Educational Project Footprints offers a new, never made before opportunity to enterprises, organizations and establishments to educate their employees in environmental matters. This is a great opportunity for enterprises, establishments and organizations to show concernment in improvement of our common environment and in educating their employees, at the same time to give a shine to enterprise’s prestige, for environmental concern becomes more and more topical, more necessary and more popular. Arranging the said action the Project Footprints hopes not only to educate wider, then before, layers of society in elementary issues, but also to attract attention of adults to environmental educational issues, which up to now haven’t been touched and solved a lot, therefore we do hope that this action will gain wide sympathy, developing a new environmental educational sector, which will cover all groups of the society. In order to improve the situation in the sphere of environmental education and environment awareness, the Embassy of Great Britain in Latvia in cooperation with the Project Footprintsarranges a project contest "Green Triathlon. The same as in sports, also here schools will participate in a contest that will combine sectors, which can be presented as separate disciplines, but three of them will altogether have the greatest effect. 3) reduction of impact on climate. Details are rendered in the Regulations. The enclosed form of the project and the estimate are nonbinding, participants may develop individual forms, but enclosure of below questionnaire points is compulsory. It is necessary to take into consideration that prior to submission of the project the application questionnaire MUST be sent, otherwise a school project shall not be considered. The Project Footprints invites school pupils and students to participate in creation of a new issue about local environment! The issue, which continues traditions of our already existing Project's Footprints newspaper, is a great opportunity to active, creative and close to journalism young people to speak about environment, at the same time getting and accruing experience in journalism. Published works will be screened in a form of contest, proceeding from the regulations, published below. The contest will be carried out in the course of the year in various terms, each of them will be announced asunder at the homepage of Footprints, the first term – 15th February. Though „Project’s Footprints” this season’s joint work has been finished, the work itself keeps out of winter sleep yet and doesn’t cover with white snow waste thrown and left on banks of ditches, in parks. For a long time students and teachers of the Agenskalna Primary School have fought such piggishness, either publishing information and pictures about the situation in their neighborhood or applying to us with ideas on necessity of another joint work. And so on the 7th of December in the afternoon another joint work occurred!!! Thanks to the Executive Direction of Kurzeme region for support and THANKS to all those, who participated!!! and appeal to cooperation so that we could jointly change something. The Project Footprints in cooperation with the mission of the organization “Friends of the Earth” in Finland throughout winter months arranges an action „Snowmen vote”, with the help of which it hopes to attract public attention to saving of resources and waste regaining. During the action residents, representatives of organizations, establishments and enterprises shall be invited to make in yards of buildings, parks and squares snowmen, using for decoration natural materials and which in hands (next to, on heads, signs at necks etc.) would hold captions, reflecting attitude towards inexpedient usage of resources, for instance, ”I vote against plastic bags!”, „I vote for waste regaining!”, „I vote for saving of water and electricity”, „I vote against salt on roads”, ”I vote for ants in cities” etc. 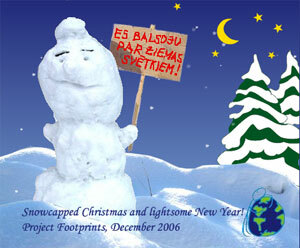 In Finland, where representatives of the Project Footprints work actively, such snowmen actions have been taking place for already two years, drawing attention to changes of climate, involving cities in Finland and other countries (Estonia, Bulgaria, Hungary, Russia, Norway, Sweden, Slovenia) and gaining huge sympathy. Unlike the campaign arranged here, in Finland it is being organized as a two-day event. More information about the day of snowmen in Finland you can find here. 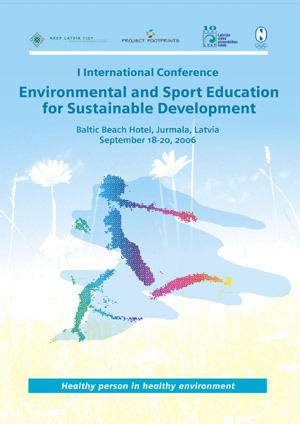 I International Conference - "Environmental and Sport Education for Sustainable Development"
Project Footprints starts vigorous activities in the regions! To popularize and accomplish the most efficient non-formal environment education, the environment and education Project Footprints started vigorous activities in the regions. Continuing that commenced during five years of activities this time the project Project Footprints also involves the most active public – the youth. We invite people from all Latvian regions who confirm the necessity of non-traditional environment education and the lack thereof in the periphery of Latvia to co-operate during a week with school No.85 that has responded already to the call. At present the schools that have responded already receive parcels with the informative materials, very soon there will be announced the arranged competitions and the local consulting activities will be carried out to form teams. The schools that have not applied yet may do it writing by e-mail address lana.saksone@pedas.lv, it is possible to receive the materials at the address: Gleznotāju iela 4, Riga, having preliminary kept in touch. Co-operation with regional schools will draw attention to the environment problems, driving the youth to think over and change their mind looking at themselves and the environment; simultaneously facilitating the all-round and full value development of pupils’ individuality that can not be conceived without the environment education. 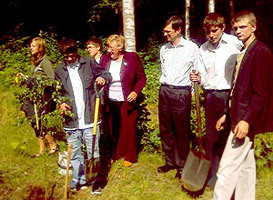 On November 3-4, 2006 there took place a special plenary meeting arranged by students local administration of the Latvian Arts Academy at Pavilosta Peleka dune. The plenary meeting was aimed at reflecting the relationship between the nature and a person. The main attention during this plenary meeting was paid to the territory, where Peleka dune gradually transfers into the woodland dune and boreal woods, which also represented the protected area of European significance. Pavilostas Peleka dune is the widest grey dune in Latvia. Its area is 812 meters (usually it is 5-10 meters wide, which is eighty times more than anywhere else grey dune located at the territory of the state. Formation of the nature restricted area in such the territories all over Europe is the practice taken for granted, and the legal nuances related to it have also been stipulated by Latvian legislation, however be the reason of unknown consideration it does not come into effect in full or by no means implemented. 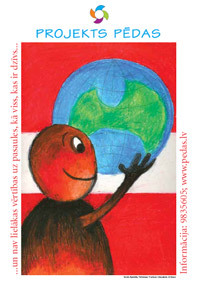 With the September 26 event that took place at Ķīpsala Hall, the environmental and educational project Footprints concluded its seasonal activity for the year 2006 which was the fifth during the history of its existence. This action is the last one this season, where you will have opportunity to profit a free ticket to the “Footprints” Large Final Event, which this year takes place in the Ķīpsala Hall, on the 26th of September. The seventh issue (July, 2006) of the Footprints newspaper has been released! "The Path of Baron's and Peterson's"
THE FOOTPRINTS SUPPORTS AND RECOMMENDS! Let’s go to Alūksne !!! Welcome all who are enjoying active recreation in nature’s lap. The signet of secrecy will be removed during the camping day. 1st place – Māris Nadejs from Valmiera 5th Secondary School. 3rd place – Ance Niedrīte from Valmiera Viesturs Secondary School. Distribution of places was defined through public voting. We’ll deliver awards to your school. Exhibition ''I love my town'' can be viewed at the Vidzeme Olympic Center till 16th May. On the 4th of May Pēdas Project in cooperation with the Latvian State Forests organized an action 1=2, during which there were carried out cleaning joint work in Plakanciems and tree planting to commemorate the Latvian Republic Independence Declaration Day. Idea of the action – instead of one sawn down tree we are planting two!!! A boom on a possibility to get infected with HIV, if contacting with a thrown, used syringe, in reality is strung up. HIV infection might happen only if blood in the syringe is fresh, i.e., hasn’t been coagulated. In this way health care professionals can get HIV infection having contacts giving injections – or rather, incidents follow each other – a sharp subject or a syringe has been just in contact with a patient, but the next moment it comes into contact with a medical worker. Through syringes thrown in public places, staircases etc. unless they have been just used, one cannot get HIV infected even though a lot of blood is left in the needle – the virus has already died. But still there is a possibility to get hepatitis viruses, specifically B hepatitis, which is very resistant to environment! It is impossible to say any precise figures how long syringe and needles might stay infectious since it depends upon external conditions thereof being preserved. It is important to acknowledge that risk may remain and when cleaning up, as described above, one should avoid to work “barehanded” as much as possible! Should you find a syringe or needles, for sure you must not entrust to collect thereof to children! That is responsibility of adults. Thereof must be collected (using gloves, of course!) into puncture-proof containers, for example, into plastic mineral water bottles, which, if possible, must be screwed. Such bottles cannot be mixed with other waste so that to avoid perforating thereof if pressed! It is unknown if there is a place where those, who don’t have a specific agreement, should transfer thereof for destruction. It would be advisable to contact waste processors. HIV preventive points, where drug addicts get the used syringes changed, cooperate with Lautus LTD (ph. 7317280) that destroy medical waste. It is possible to agree with neighboring medical establishments, for instance, hospitals, which have agreements on destruction of medical waste. It is very important to motivate people to tidy up environment and public places, but also to inform how to protect themselves. We are in charge for environment we live in (bearing in mind also society), and if we wish to live better we have to do our best. Attention! Right now, it is also possible to call Footprints over the telephone - 7509392! As well as still - 9835605! 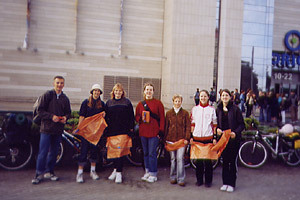 Within 2 – 5 March the FOOTPRINTS participated in the 12th International Education Exhibition SCHOOL 2006, organized by BT1! On Friday, on the 3rd of March on the hall’s Big Stage there took place a unique AUCTION. Congratulations to a unique, last summer randonnee „Krisjan Baron’s path” 940 kilometer endured bicycle’s new owner and also definitely potential participant of this summer randonnee Vita from Jekabpils. During hard auction she didn’t retreat in front of men and with a final amount of 44 lats acquired this, frankly saying, bicycle that has endured various setbacks, which, hopefully, will be loyal to Vita during all her activities further on! The sixth issue of the Footprints newspaper has been released! 4 Gleznotāju Street – Room 303. 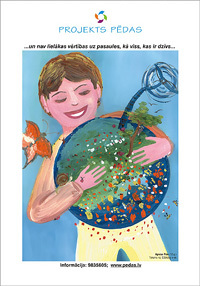 There has been released a new – February issue of the magazine "Vides Vēstis"! This magazine is designed for those, who are seriously interested in nature and environment. Footproints has expanded the geographical spectrum of its action, and right now, it is starting to act in Kenia (Afrika), too. After the business visit of Footprints leader Vita Jaunzeme in Nairobi and thanks to two new sportsmen, trainers and environment activists Footprints ideals and principles - „Save our Planet” - start to get used little by little for managers Juma Kent and Yusuf Motha of Footprints in this region. Pedas has its representatives in Kenia who, together with their supporters, organize different sports and charity events, including environment keeping activities in them. As the proof of the successful action is the “Award” received. In its turn, the Project Footprints expresses gratitude to its representatives in Kenia - Juma Kent and Yusuf Motha for the work put in, popularizing the green thinking. Project Footprints 2005 Final has passed! Thanks to everyone who came and participated!!! See you next year! At the Final of the Project Footprints at Karaoke contest the Grand Prix – in the amount of EUR 100 – received by Emīls Kivlenieks. Congratulations! We invite gifted young people to practice their voices and to participate in karaoke contest next year. The Audience Recognition Award in close contest against the band AK69 was won by the band from University of Latvia „Trakmēnes”! 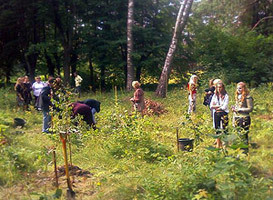 This (2005) year the Footprints have organized 14 waste-collection bees in Latvia cities, mostly in Riga – capital city. In total approximately 600 m3 of waste was collected. The “Footprints” newspapers’ fifth issue has been published! The Project Footprints has agreed on further cooperation with Latvian Underwater Hunters Club. Therefore during our joint work we’ll be able to clear up also water reservoirs not only rivers’ and lakes’ shores. "Latvian Underwater Hunters Club" – has been founded to popularize underwater hunting and healthy life, and to unite confederates of various age and nationalities – those who are partial to our water reservoirs ichthyologic and ecologic condition. The Club is planning to make clearing of water reservoirs and fish release arrangements, spot-checks in cooperation with environment inspection, competitions, establishment of contacts with foreign partners and in cooperation with other Latvian clubs to obtain underwater hunting license. Everyone who wants and can help our nature, who is fascinated with mysterious and inimitable underwater world, may become a member of our Project. Footprints’ team took the 1st place in the People class and Sport Authority Cup as the largest team – 55 participants! Congratulations to all team members with the victory! PROJECT FOOTPRINTS randonnee "Path of Krishjanis Barons"
The large prize was awarded to Aili (Estonia). Congratulations!!! 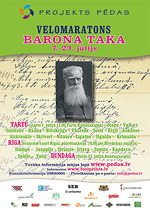 See you on 7 July 2006 at the House of Latvian Society! On 14 May in Mezhapark the Tracks spring season was closed! 290 people participated in the joint work and totally there were collected 56 m3 of waste. In the final joint work for the first time in history of the Tracks (and of Latvia) there participated employees of "Hansabanka" JSC and its Director General Ingrida Bluma. Thanks to Hansabanka for the support and courage to participate in the joint work"! "Hansabanka’s team in close contest came out on top of other 4 teams ("Laumiņas" /Pixies/, "Zaļā komanda" /Green Team/, "Tīrais, jaunais laiks" /New, clean time/, "Ar dziesmu pa Pēdām" /Singing on the track/) and collected two 8 m3 containers. 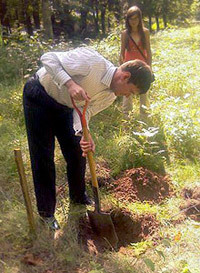 The joint work was attended also by the Minister for Environment Raimonds Vejonis, Ex-Prime Minister Indulis Emsis. Their team - "Zaļā komanda" /Green Team/ took the 3 honorable place. A representative of the Riga City Council Imants Rakins worked in the team "Tīrais, jaunais laiks” /New, clean time/, which took the 2 honorable place. DJ of the joint work was an Olympian Martinsh Rubenis. Congratulations to everybody with closing of the Tracks spring season! Totally during the spring joint work there were collected 368 m3. And 2070 people participated!!! Thanks to everyone!!! A photo gallery on the spring season is coming soon. And see you on the randonnee "Path of Kr. Barons" and at the autumn joint work! Thanks to everybody, who supports us! 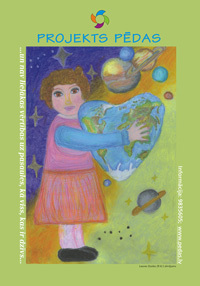 The “Footprints” newspapers’ fourth issue has been published! The Footprints project has started the year 2005 with new plans and new ideas. The signing of the cooperation agreement with JSC Hansabanka shall be regarded as a special EVENT involving greater possibilities to fulfil all plans and ideas born at Footprints. Altogether over 20 banks are active in Latvia but at present only Hansabanka has seriously started to support the green ideas and green thinking, which indeed was a pleasant surprise to all really green ones. The Footprints project will start its activities already in March! Because of the cold weather the party OGRE – MY DREAM TOWN is postponed from 4 March until later!!! Arrival in working clothes and warm footwear. Arvis Auzins, the party organiser, will ask all pupils and young people to take part and tidy up and develop one’ dream town of snow (if there is such). The Footprints autumn season of communal work. Second issue of the Footprints Newspaper is out! Green bicycle race Saulkrasti - Ainaži- Lake Burtnieks-Valmiera (28th to 30th August) organised as part of the Project Footprints has finished. 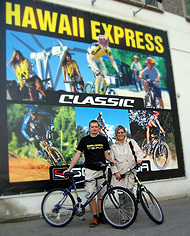 "Hawaii Express" Ltd presented its bicycles to the "Project Footprints"! We consider that the "Project Footprints" has its supporters, since we are am struggling more and more actively for health friendly environment, pure, ecologically spruce. Therefore a bicycle is the best transport means not only for everyday up keeping of human health, but also for environment preservation. · A bicycle as ecological transport means is the most friendly to environment and therefore to people. · A bicycle helps to take off stress. · A bicycle doesn't demand big investments. · A bicycle ensures a good figure and a good complexion. · A bicycle is an attractive transport means. "Project Footprints" would like to thank "Hawaii Express " team for conceptual and material support! The “Project Footprints” granted admission to three new team members. We CONGRATULATE newcomers and wish them inexhaustible energy and optimism in such a responsible and meaningful mission!!! A PROJECT FOOTPRINTS IS LOOKING FOR NEW MEMBERS FOR THE TEAM! We kindly ask those interested to write to our post box ! A new subject is taught in the Riga Technical University:"Environement Engineering" (or the art of cohabiting with the environment). The waste-collection bees of the PROJECT FOOTPRINTS have been included in the practical part of the curriculum !!! The subject is a voluntary discipline in the C programme. It consists of 8 lectures spread within a period of an academic year. Dr.Hab. Ivers Veinbergs, Dr. Talis Juhna, Dr. Daina Kalnina, Dr. Ruta Bendere, Dr.Gatis Bazbauers. By signing up to this discipline you can earn two 2 credit points a year! Students of other higher educational establishments are also welcome to attend this subject! The PROJECT FOOTPRINTS announces a competition on the name of a new type of sports, as our waste-collection bees are not merely bees anymore but real competitions. So, as they are competitions, they should become a type of sports. Waste-collection competitions ... somehow it does not sound well. Do you have bright ideas??? A prize is guaranteed for the best solution!